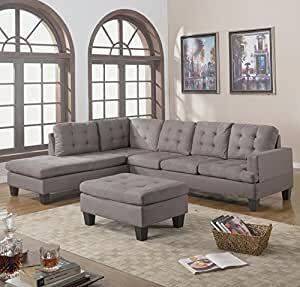 3 Piece Reversible Modern Sectional Sofa with reversible Chaise and matching ottoman provides a clean modern look to any living room decor. Ultra plush microfiber cushions, medium firm modern cushion feel, easy to assemble. Shipping includes CURBSIDE delivery only, will not delivery inside residence. Please provide valid phone number at check out to ensure prompt delivery. 100% Polyester, Removable cushions for easy cleaning, spot clean rest. Please note this sectional is now reversible, chaise can be positioned on either side. The couch is nice, but it’s really short. It’s firm, but I like the firmness. The color is true to the image. It look good in the picture, but I wouldn’t recommend it. Cheap material. Incredible sectional! Very fair price for how great of a couch it is. As someone who prefers slightly softer furniture, I was unsure how this slightly harder piece of furniture would work for me but I have been very pleased. The microfiber is very soft which makes up for the firmness of the cushions. The ottoman is very convenient for turning any spot on the couch into a laying spot for two people; or just extra room to stretch your legs. The color is as advertised. Setup was done alone and pretty painless! It was shipped well in two separate boxes that could probably be transported alone if need be; otherwise, very easily with a dolly or an additional person. Overall, great experience from beginning to end! I was a little hesitant to order furniture without testing it out first but this absolutely passed the test! I highly recommend this sectional! DO NOT BUY THESE COUCHES. LOOKS NOTHING LIKE THE PICTURE. VERY CHEAP AND UNSTURDY MATERIAL. EXTREMELY UNCOMFORTABLE AS WELL. Absolutely love this sectional. Came a little later than expected but definitely worthwhile the wait! It’s a little on the firm side right now but we know when it’s used more it will soften. This couch is huge. I can lay down on one part of the section and my husband can sit by my feet and we coul still fit 2 more people. Amazing couch for an amazing price! The sectional looks very nice and the color is great. The quality is not the best, however the price is very low for a piece of this size with the ottoman included. The portion that you sit upon is hard, but not so bad that you can’t completely relax. It’s very roomy, and if you’d like to entertain the chaise accommodates extra seating. I got what I paid for. Cushions are softer than I thought they’d be. And it’s a great size. Came in three large boxes, but they were slim, so very easy to get inside. The couch is true to pictured color, like a medium grey, and a little stiff, but I prefer it that way so it lasts longer. Very versatile, and looks great! Only downfall is the back of the couch is a low back, so it only hits mid back on me (I am 5’3). Otherwise, I love it, and it was a great buy!